I am grateful for that winter under Kyiv’s open sky that made me human. [Because] I hated this country altogether. And for what would I love it? I visited Europe, I saw how everything is there. And I did not understand for what would I love this wretchedness under the name of “Ukraine.” No, I did not love [it]. If, only a year ago, I’d been told that I would fall in love with this country – I would not have believed it. But that is how love comes nonetheless, it comes when you least believe or hope for it. I never thought that one day I would be considering my identity within the context of this country’s history. I could not even imagine that a silver trident on my neck would be dearer to me than all the diamonds in the world. For this trident is not just a decoration. It is a symbol of my love for the country in which I was born, this is my personal [good luck] charm. 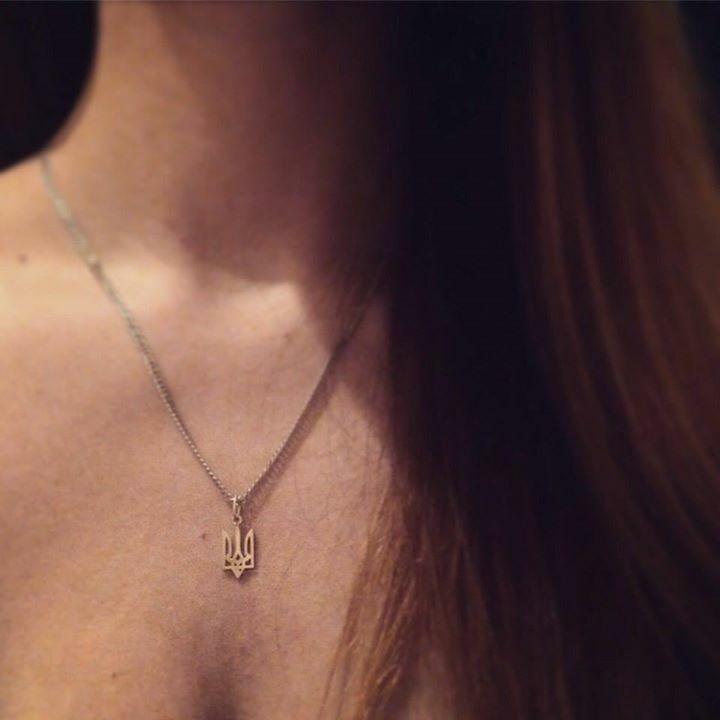 I very much love the Ukrainian language, I worship my fellow countrymen, I think these are the [most] unique people [out there]. I am proud of them. Of you. I remembered all the prayers that I was taught as a child, because sometimes when I hit rock bottom, all that remains – is to pray to the Universe, so that the best people of my country would stop dying, so that my land would be finally left in peace, so that no animal would prevent me from living and breathing freely. This will likely never be understood by anyone who did not live through last winter exposed to the bitter sky of Kyiv. But whatever happened then, I am grateful for that winter … I am grateful to her for making a human being out of me. And who I was before that – I do not remember anymore. And I do not want to remember. This entry was posted in "Voices" in English, Analytics, English, English News, Maidan Diary, Pictures and tagged #RussiaInvadedUkraine, #UkraineUnderAttack, EuroMaidan, identity, Maidan, Ukraine. Bookmark the permalink. 3 Responses to I am grateful for that winter under Kyiv’s open sky that made me human. Oksana, I welcome you to the family of Ukrainians who never gave up dreaming that one day, we will truly live free. You and I have lived under different circumstances, but I understand you far more than you know. I was not freezing with you on Maidan, but, like so many others around the world my normal daily life stopped as I lived through every moment with you through that December and January and February and even now. You see, I have been waiting my entire life to return to a home where I was not born, but nonetheless, never considered it a foreign land, only a land occupied by foreigners. I remember my childhood years where everything Ukrainian was treated as if it was something Holy, something that we could touch to be near to our homeland. Yes, our homeland, even though we did not live there. From my first memories I was raised to think of myself as a Ukrainian just living temporarily in another country until ‘we would go back home’. I learned Ukrainian, its history, culture, music and customs. I fell in love with her poets and writers and artists. I did all this because my Mother taught me that these things would be important to me one day so that I would not be a stranger in my own homeland. Time passed, my life went on. Ukraine was still not free. But I never forgot where my home was. Eventually, I started to save things for my future children, intent to teach them as I was taught, so that they would never forgot that they too, were Ukrainians just waiting to ‘go home’. And more time passed. Then, in August, 1991, a miracle happened. Nothing was certain. Anything could change in a moment. But we went ‘home’ in September. We left not even being certain that it would still be free by the time the plane landed in L’viv, not believing that this was real. I did not want to want to fall asleep on that 30 hour journey, afraid that I would wake up and find that it was only a dream. Somehow, in my heart, I just knew as we came closer and closer, that those tall peaks poking through the clouds were the Karpaty. And then the pilot confirmed that we had crossed into Ukrainian airspace. I cried. Some people applauded. Someone started to sing ‘ A my tyju chervony kalynu…’ My Mother and I cried as we finally stepped onto that sacred land. It was not an easy journey for my Mother. She still remembered the tragedies of WW2 , the family that died or was executed or simply disappeared into the gulags of Siberia. She especially remembered the love of her young life that vanished somewhere into an unmarked grave, in an unknown battle, in a distant forest at the hands of an inhuman Soviet enemy. We saw what was left of her parents home, destroyed by the bombings, and Grandfather’s field that had become part of a collective farm and the school she went to. We even met two old ladies that had once been her childhood friends, the young girls of my Mother’s memories who would laugh together and sing songs and pick wild flowers in the field. But, to my surprise, this was not the Ukraine that I was expecting because far too many people were still not even certain what it meant to be Ukrainian. But, I did not lose all hope. I still planned to ‘return home again’ because that had been my dream and my promise to myself for over 50 years. Thank you, Oksana and all those lie you, for finding yourself on the Maidan, and for cherishing that silver Tryzub with the same love that I have cherished the one my Mother bought me so, so many years ago. My life will be different there, I am certain. And I may miss some of the things that I have grown accustomed to. But, I can finally come home and I will not feel like a stranger because Ukraine has been reborn and her children have come to love her at all cost the way that past generations once did. Thank you for sharing that, Liliana! That describes a very powerful aspect of the diaspora’s shared experience. Oksana, I am a British citizen and have been resident in Ukraine for seven years. I feel the same about Ukraine as you do!